« “Boy’s Weekend” … ya got one? 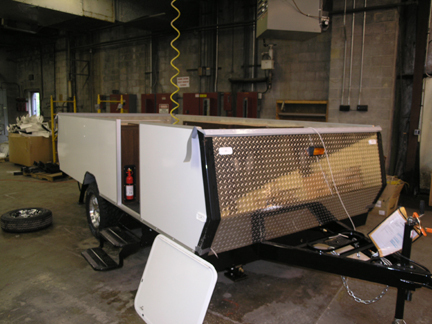 Ultimate bird hunting trailer by Aliner shaping up! Talk turns to ideas turn to sketches then blueprints and now it’s becoming reality. 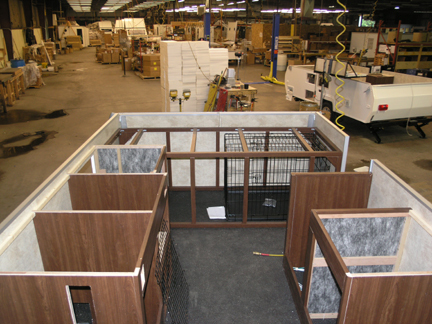 Aliner’s Ned Collins just sent these photos of the Wingshooting USA official travel trailer under construction. Learn more about how they think – and what they do – by clicking on the logo. By the way, many of your ideas are a part of this rig, so if you ever see it on the road or in the field, stop by – I owe you a cup of coffee! Buddy and Manny have separate bunks, under mine! Bomb-proof floor material, too. Exterior diamond plate - this rig will see a lot of gravel roads. Is this a model they are doing custom for you or are their plans to make it commercially available to the public when completed. I’d be very interested if they plan to roll it out to the public. If not I’m envious!!!!!! This is a bit customized, Mark, but they would probably do the same for you … or anyone else, even if they don’t own a Boykin! It’s taking shape and looking good!